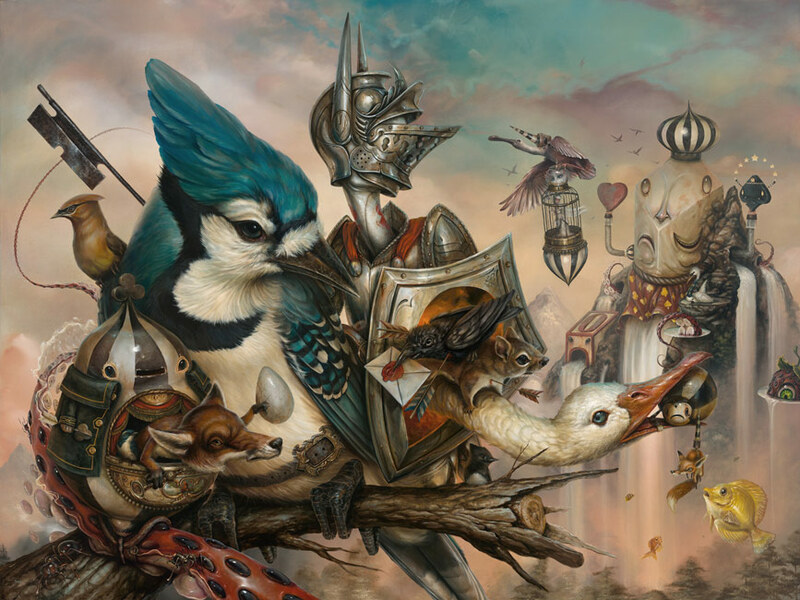 Greg ‘Craola’ Simkins remembers what it was like to be a kid. He is able to vividly recall the permanent state of curiosity and wonder that we all experience in our formative years. 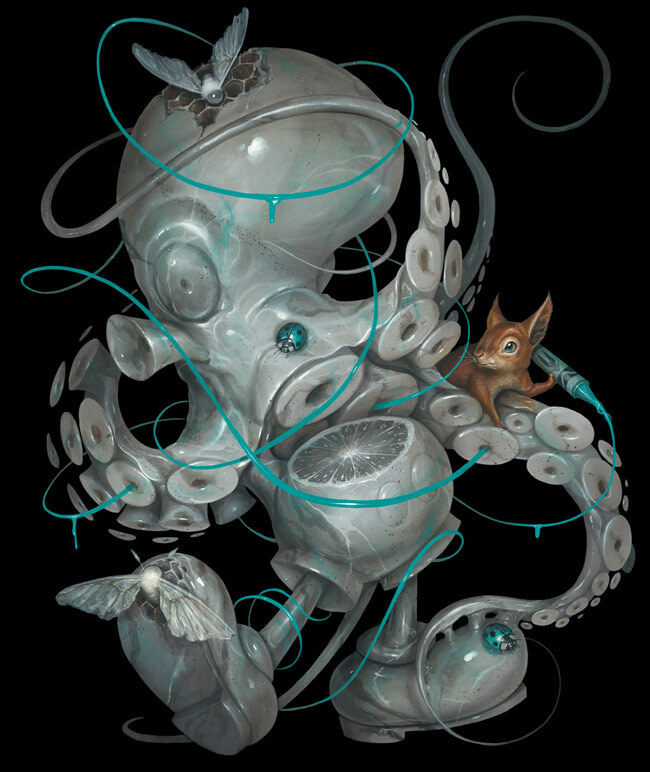 The memories from this period of his life have had the most profound effect on shaping the artist that Craola has become. To this day, he is still able to tap into the bottomless well of imagination and storytelling that most of us leave behind when our years of existence on this planet reaches double figures. 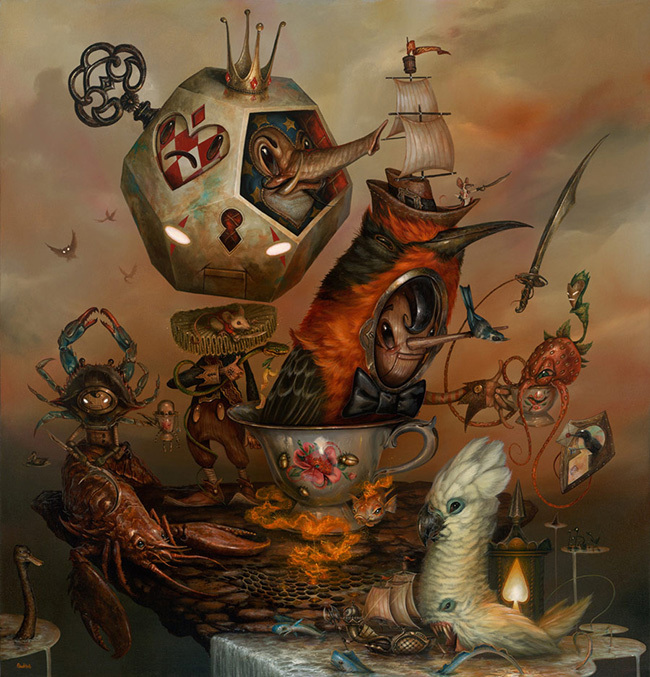 If an art loving sorcerer waved his magic wand over the head of an incredibly excitable and imaginative six year old, and granted him the painting skills of Michaelangelo, you could expect this child to produce something akin to the breathtaking images Craola has lined up for us in ‘Where Am I?’, his upcoming solo exhibit at Merry Karnowsky Gallery. 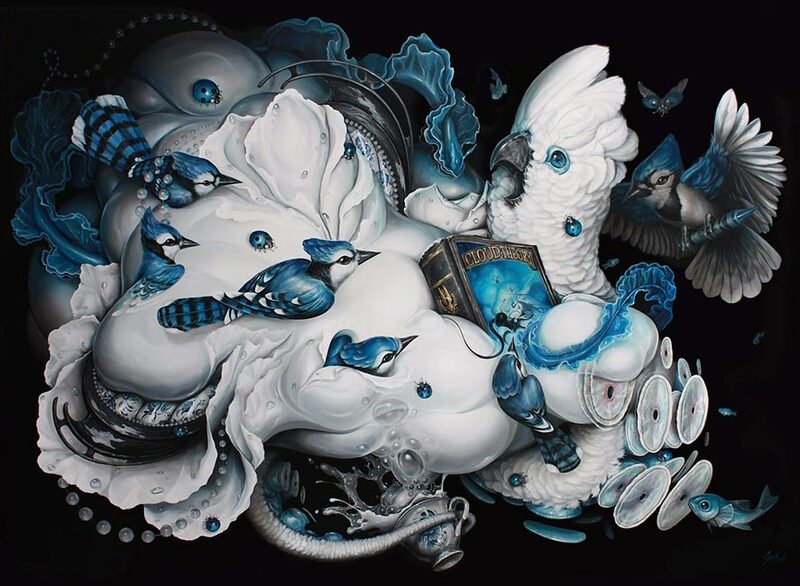 Craola was born in 1975 in Torrance, California, just south of Los Angeles. 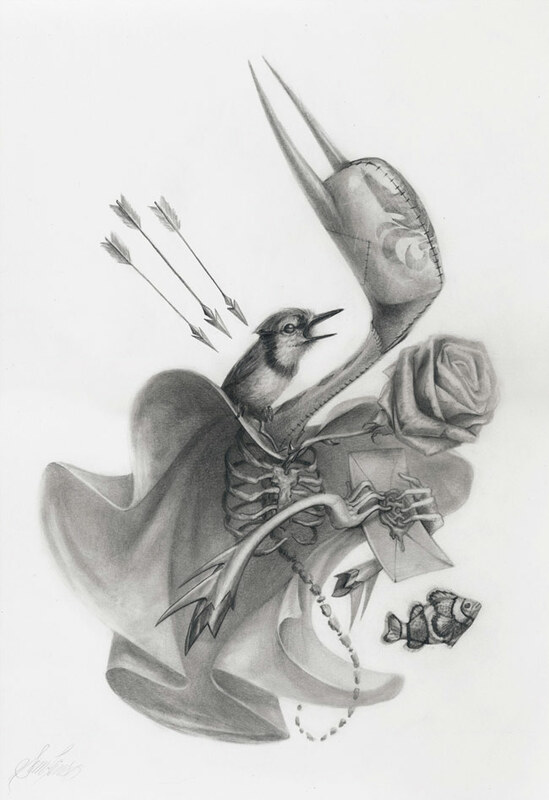 At the age of 18, he became active within the local graffiti scene, where he developed many of the artistic skills that he later transferred to his fine art. 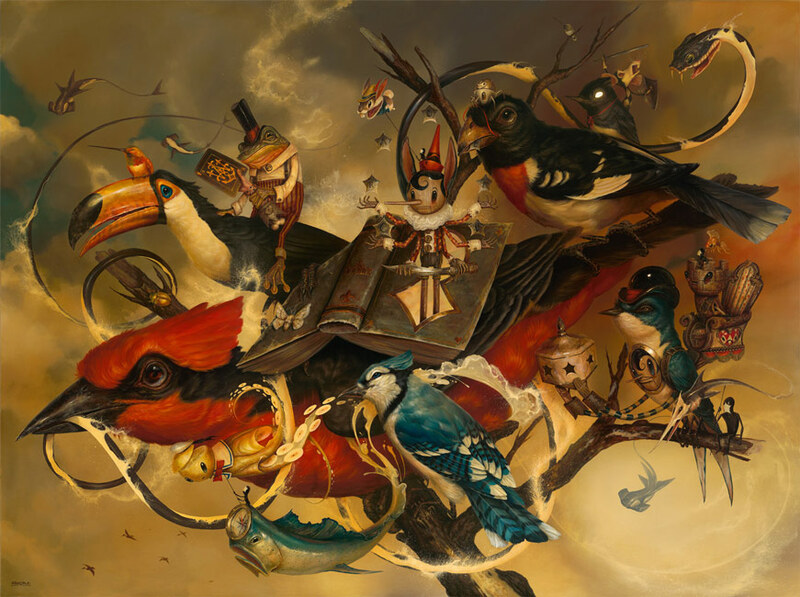 Craola received his Bachelor’s Degree in Studio Art from California State University of Long Beach in 1999. His artworks are highly sought after around the world, and they have attracted a great number of celebrity collectors, including the late, great, Robin Williams. 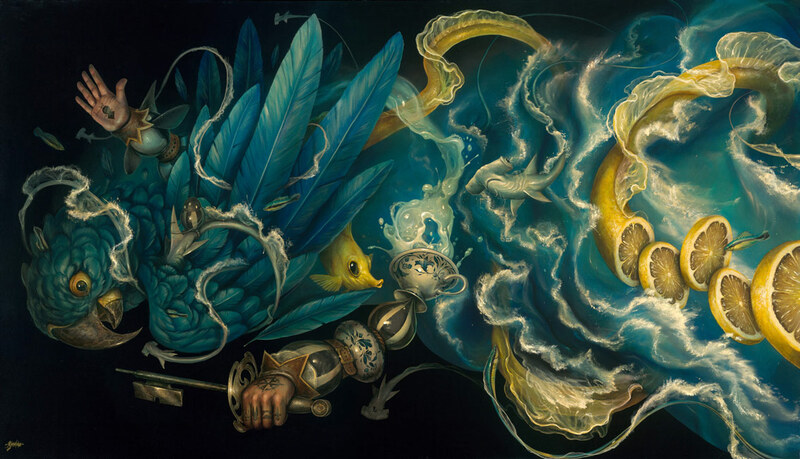 WOW x WOW is honoured to be able to bring you this exclusive interview with Craola in the week running up to the opening of ‘Where Am I?’ Read on! Hi Greg! First of all, thanks very much for taking the time to have this little chat, we really appreciate it. 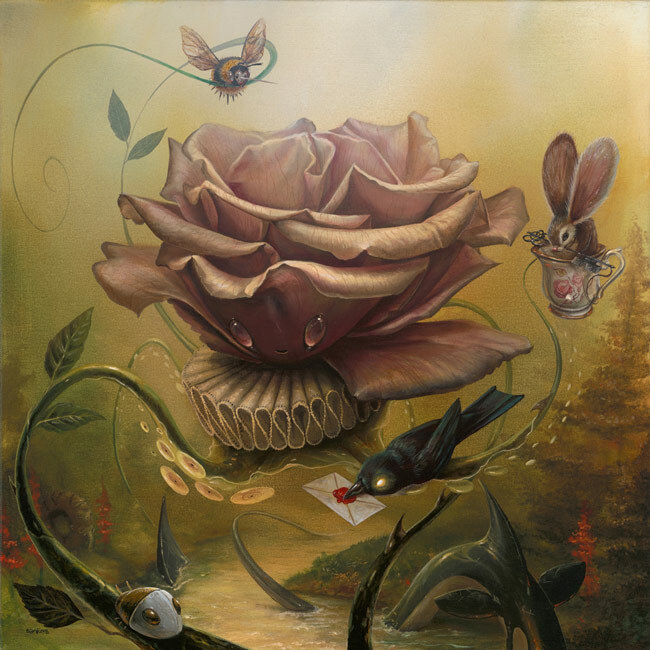 To start us off, if you would please introduce yourself, touching on anything you feel relevant to the story of Craola the artist? 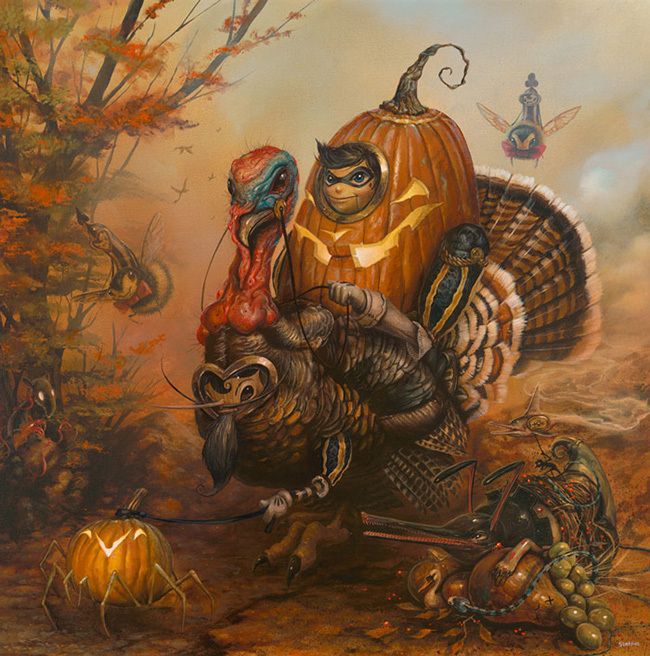 No problem, My Name is Greg ‘Craola’ Simkins and I make pictures. 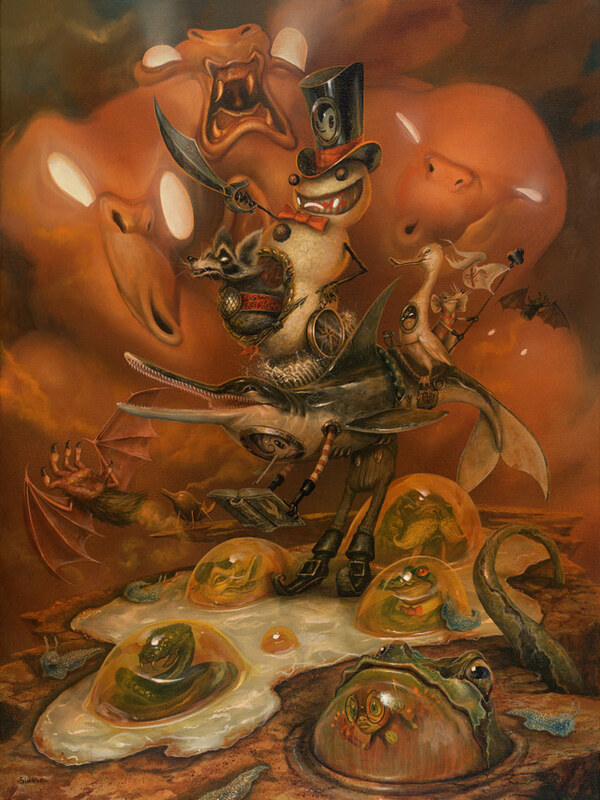 I got the name Craola from a wizard disguised as a frog. Let me back up a bit though. It was an unusually cold day in May and as I was walking through the marsh near my house, I noticed a little frog freezing on the path. I didn’t hesitate, but took a box of crayons out of my Star Wars back pack and emptied it of all the crayons. I made a little house for the frog and he crawled in for warmth. At that moment he turned into his wizard self and dubbed me ‘Craola’ and thanked me for my kindness. Afterwards, I went home and ate Cheerios. 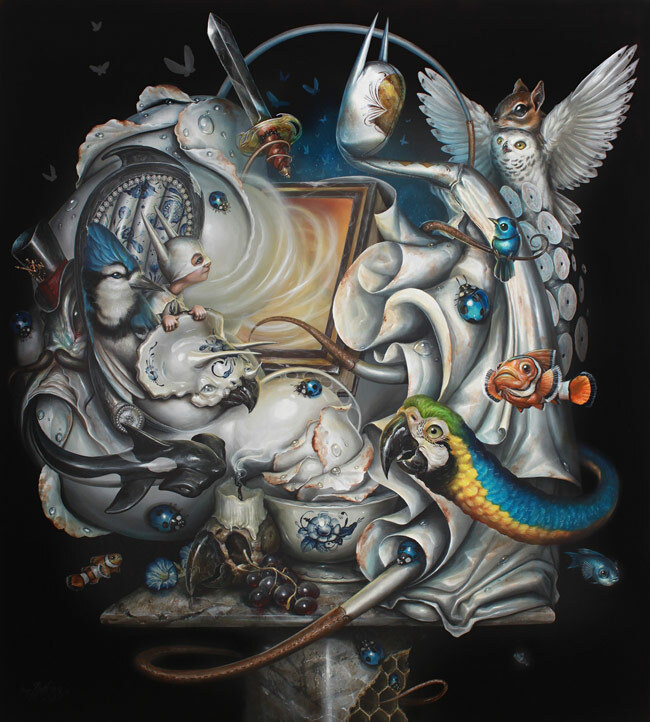 You have an upcoming solo show entitled ‘Where Am I?’ opening at Merry Karnowsky Gallery on May 23rd. Can you give us a little insight into the ideas and themes you’re exploring in the new work for this exhibit? My main focus when beginning this show was to flesh out the world I call ‘The Outside’ some more. I wanted to involve some of the more absurd characters that exist there and include multiple story lines in each painting. There is a point during our lifetime when we lose our childhood excitement and curiosities, and become infected with the problems of adulthood. It’s like that part of our brain begins to hibernate or even petrify with every new responsibility and each passing year. Growing up is a good thing, there are lessons to be learned and passed on to the next generation, but, I believe we need to have these windows to glimpse back into and remind us of those feelings we had as kids. What was the world like just beyond the closet door? What is scratching at my bedroom window? What if there really were other worlds to explore and have adventures in and who are the strangers we’d meet there? And, the very first words you would utter once finding yourself a stranger in that strange place, stuck outside, would be, “Where Am I?”. How do you approach the creative process? Talk us through how you construct a painting. Do have a concrete idea of what it will look like before you get started? What type of reference do you use? 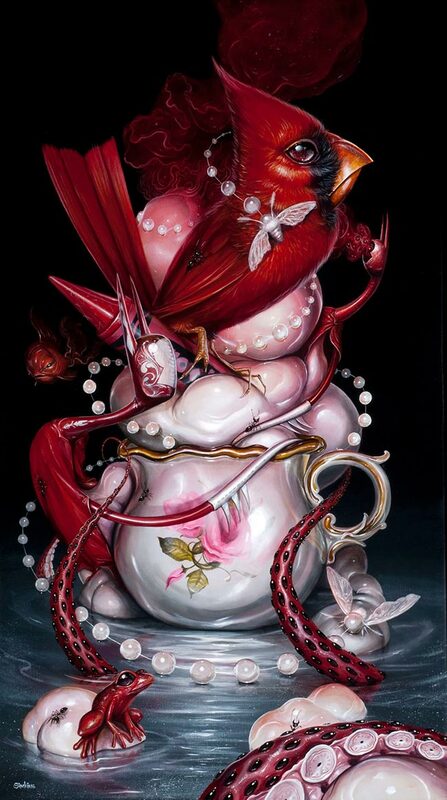 There are various ways that paintings come together. When creating any painting, I always draw a bunch of thumbnails to get a general flow of a piece. These sketches are really small and made in my pocket sketchbook. I value these books more than the finished works as they are full of sketches and notes and ideas. Once I get a good idea, it could go in a variety of directions. I usually scan it into my computer, resize it to fit a certain size canvas, print it out at that ratio as a yellow line, then redraw it. I then research reference that would speak to the elements of the piece, fur patterns, feathers, landscape photos, textures. I then transfer the line work to the canvas and start painting. I always allow for spontaneous extras to be added to the canvas. Almost every time I work on a painting, once the colors start going in, new creatures begin to appear. 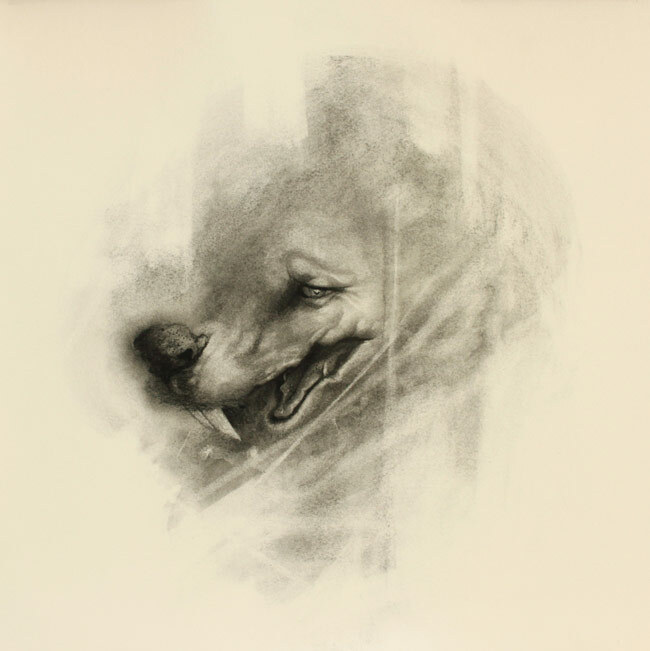 I generally keep a white charcoal pencil with me so I can sketch it and then paint it in. Sometimes I flip through my sketchbooks to see if I am forgetting about any characters or elements that I was pondering weeks before. Once the last element is finished, I stare at it and check the balance to see if perhaps anything else should be added to it. Then it’s varnishing time and off to the photographer. Storytelling and narrative are at the heart of what you do. In your opinion, what are some of the most important ingredients that go into making a successful visual narrative? I really enjoy telling stories with my kids. Right now, my oldest is 7 years old and we have the best talks about monsters and scary things, Jedi’s, warrior mice and snakes, battling ninjas, etc. It would be absurd for me to not engage this youthful enthusiasm and inject it into my work as it truly is a part of my everyday life now. Inspiration hits when we aren’t looking for it, I tend to try to write down specific topics and stories discussed with my kids and see how they fit in the overall them of what I do. For example. I took my boys to visit my friends reptile shop. The owner asked if the boys would like to see the 15 foot python feed. I said sure, thinking it too be like something they’ve seen at the zoo or on the discovery channel. Once the ‘cute’ rat was being devoured and his screams and thrashing around had subsided, I looked at my 7 year old and the expression of horror on his face meant he needed to talk about what he just saw, I felt bad but wanted to make it into a teaching moment, my 2 year old happily stood there eating his boogers, unfazed. The next couple of days and nights my son and I came up with a team of creatures, Mice, Rats, Frogs, Birds, any animal that may fall prey to snakes, and created ‘Operation Snake Bite’. This team of mercenaries fights snakes and carry swords and armor and have histories written about them and are highly regarded in ‘The Outside’. We began making up names for them and how they lived and died and who the heroes were. In doing this, he was able to sleep at night having just seen this ‘cute’ rat get eaten in front of him. 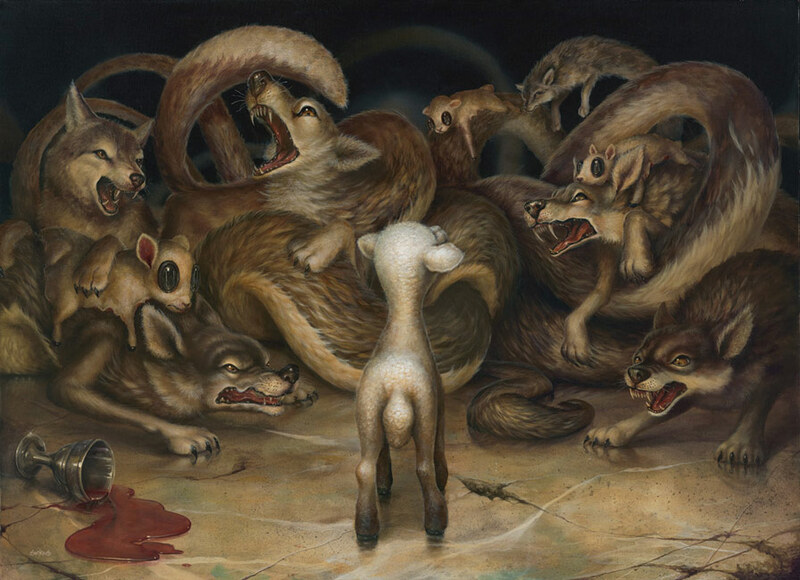 In almost every painting in this show, there is a mini sub-story involving ‘Operation Snake Bite’. Nostalgia for childhood memories and memorabilia flavours your subject matter, whether it’s for the pop culture icons you grew up with, stories that made an impression on your young mind, or your personal family memories. Can you talk to us about the importance of what shaped your mind as a child and how you go about piecing these elements together in your broader narratives? I made a list early on while working on this show. It was of all the stories that I can’t seem to shake from childhood. They keep injecting themselves into my work and I am trying to embrace them more, whereas I have gone through periods where I try to avoid them. Here is a bit of that list: Watership Down, The Phantom Tollbooth, The Chronicles of Narnia, Alice in Wonderland, Pinnochio, Babes in Toyland, The Three Musketeers, The Secret of NIMH, Lord of the Rings, The Last Unicorn, Legend, Robin Hood, The Sword in the Stone, Swiss Family Robinson, Wind in the Willows, Sleepy Hollow, Ub Iwerks cartoons and … the list goes on. It’s funny how indelible these stories have become and I feel that the unifying element to most of them is the ‘rabbit hole’ experience of finding oneself in a strange and different world and how it is to cope there. 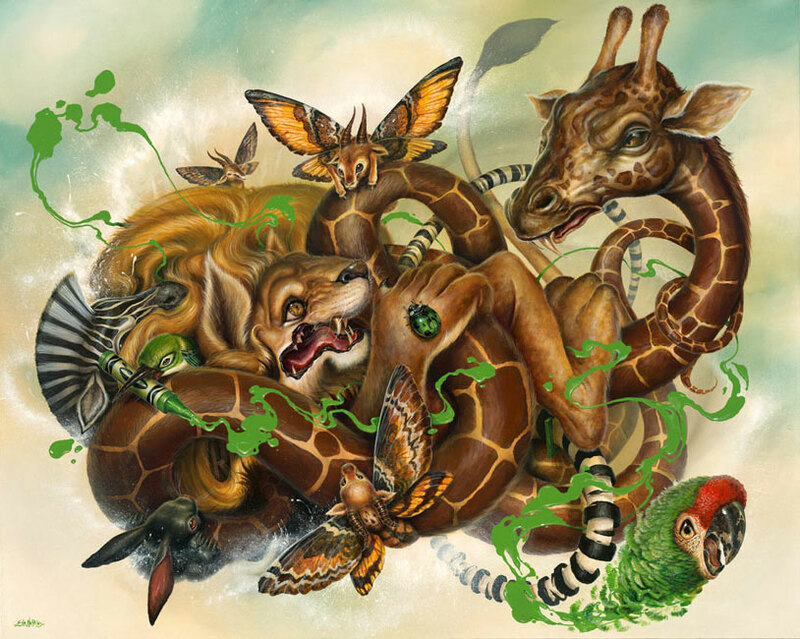 Nature, and in particular the animal kingdom, is one of your biggest sources of inspiration. What are some of the earliest memories you have, which contributed to forming the foundation of your life long passion for, and interest in wildlife? Having many animals growing up has definitely played a part. Dogs, cats, rabbits, ducks, hamsters, fish, toads, frogs, lizards, you name it. There was a period of time when I was in junior high and early high school and I was in a real awkward phase of life and adolescence, where my only friends were my pets. I was a bit of a nerdy outcast and found that I could come home from school at lunch time and take care of my dog and talk to her and she would listen. I was on a path to becoming a veterinarian for many years. This started when I was about 10 years old and a raccoon killed one of my ducks and a rabbit and left my other ones injured. My dad and I nursed the living ones back to health and administered a shot to the duck daily. That duck went on to live about 8 more years and thought it was a rabbit. Pretty crazy. My interest in animals extended far past my pets with many trips to zoos and museums, and watching nature shows and reading whatever they had in the library. It is a joy for me to share these creatures with my kids now, even though we only have a fish at the moment, we go out looking for birds and insects daily and they are learning all the names of the different animals in our neighborhood and beyond. It is hard to gauge. I try not to look back too much and just anticipate and get excited about future pieces. I think the main change is my love for doing the large 8 foot paintings the most. I used to do all these small scale pieces and thought that I had a knack for it, but as my graffiti days informed me, the large pieces have the most impact. In doing them I also noticed the amount of subtle detail you can put in a large piece is unparalleled. Now I just wrestle with the paints trying to get an understanding of drying times and coverage. These are the enjoyable and difficult challenges I give myself and am so stoked that my brush sponsors and friends Trekell Art Supplies, are making large scale canvas wrapped panels now. It gives me more opportunities to experiment on larger scale. As far as my work evolving, I feel it was only a couple years back that I finally locked in to who I am as a painter and that my story is ‘The Outside’ and that for this time period, all my paintings should take place there. Before that, it was more pop culture related works, which I’ll still do from time to time, but at some point you need to stop commenting on pop culture if your own work is ever to pick up momentum and become pop culture itself. Not really. 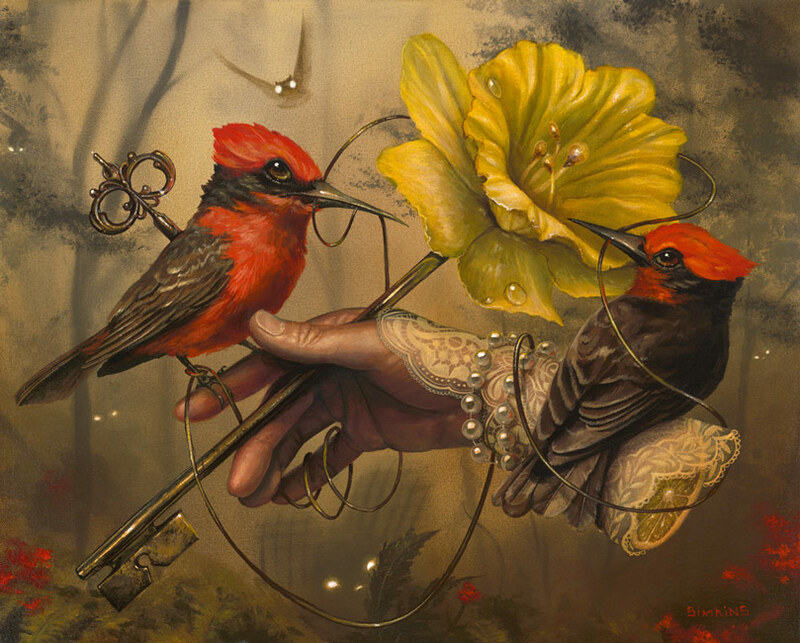 I enjoy talking with viewer about what they see in the paintings and what the imagery means to them. Sometimes I don’t offer up my description so as not to take anything away from them. Other times I spill the beans after seeing how the conversation is going. It is different with everybody. Some people just want to talk about technique as I am sure the work is too weird to connect with but maybe they enjoy the technical aspects of it. I haven’t noticed any influence from viewers back into the work though, I am just grateful and thankful that there are people who enjoy the work. How important is your subconscious to your creative process? I believe is plays a huge roll. I daydream a lot and catch myself in the middle of it needing to take down notes. Processing thoughts, I find myself wondering how they would fit into my work. I am a bit obsessive with it and need to turn it off or it gets in the way of family time. Yes I do. But I will be the fist to tell you that the specifics begin to fail me and slip my mind. I have my favorite Renaissance painters and periods I always go back to but I am not a history book and can’t rattle off all the details. 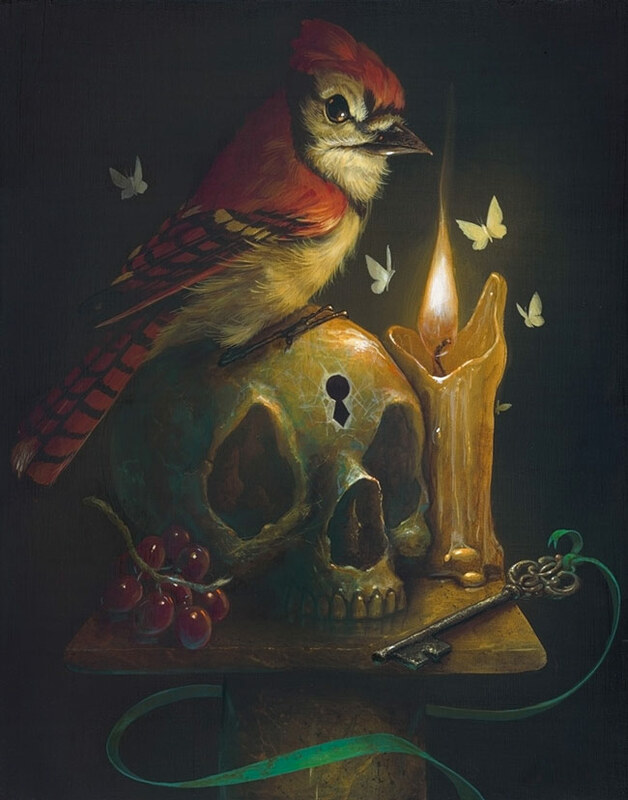 I keep scrapbooks and now that I’m older, computer files of favorite old paintings and allow the palettes and compositions to inform me. I did enjoy art history in college and felt it helpful to know what came before us. I do visit local museums if anything to shock myself at the magnitude and fine details that these artists were achieving so long ago. It gives me something to aim for. It keeps art exciting for me, just looking into the past to dictate the future. 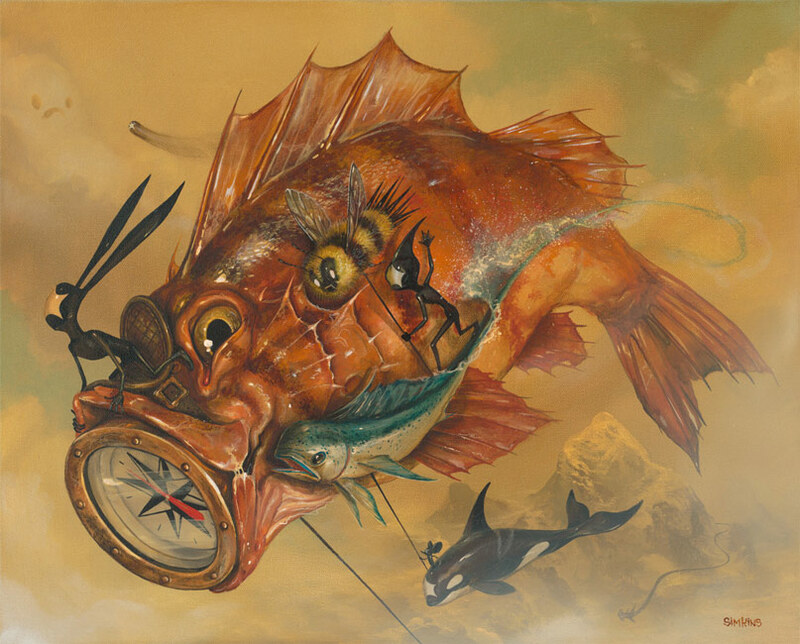 What’s next for Greg ‘Craola’ Simkins? The stop motion short ‘I’m Scared’ is getting wrapped up right now. I have been working on it with my friends at C4 Toons for over a year now. It is exciting to see what has come from just a short bedtime story for my kids and is now an actual cartoon short. It’s been an education watching the amazing team come together to create it as well. I can’t wait to see what come from it. After my exhibition, I’ll be one of the featured artists painting a mural at the Long Beach Museum of Art for POW! WOW! Long Beach which is in June and then back into the studio to create a new large body of work. It seems like there is lots to paint and draw and not enough time to do it. It’s a good problem, but I do tend to shut myself out from the world. That’s where a good day of painting walls with my friends comes in to snap me out of my solitary confinement and remind me where a lot of this started, with a spray can.